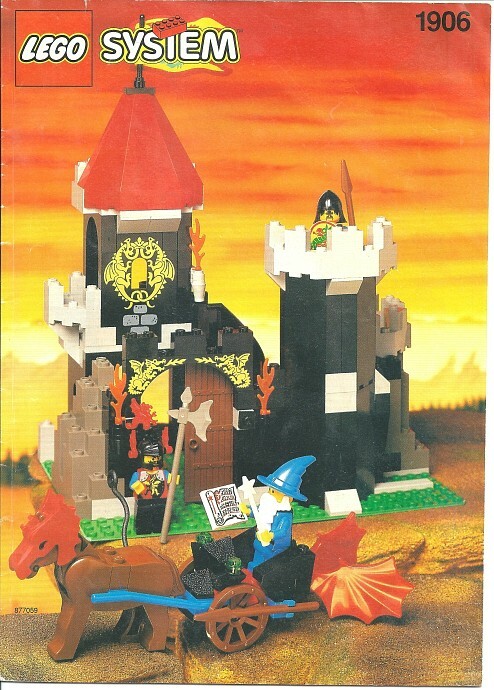 Today's random set is 1906 Majisto's Tower, released in 1994. It's one of 4 Castle sets produced that year. It contains 195 pieces and 3 minifigs, and its retail price was US$20. It's owned by 893 Brickset members. If you want to add it to your collection you might find it for sale at BrickLink or eBay. I love the box art on these classic castle sets. The red sky against the Lego display really sets the Medieval mood. No elaborate graphic art and photoshop filters needed! One of my all time favorites. I have it built on my shelf right now and my 3 year old daughter loves it! Trying to remember but it had some sort of special packaging that turned into a bigger castle. "Clickits...? Uh, YES! CASTLE SETS!! I POSTED ONE OF THESE THE OTHER DAY!! NOW YOU KNOW I'M ACTUALLY ADDICTED TO CLIckit- er, CASTLE SETS!!!" Ain't workin' on me, Huwbot. Classic Merlin wizard figure. Nothing beats it. Embodies the spirit of the castle theme. Strangest clickits set I’ve ever seen..
Hey! I video reviewed this set! I adored this line of the knights. The wizard, the dragon designs on the helmets, the dark and foreboding castles, everything about this was cool. When I was nine, the Majisto I had in 6020 Magic Shop was always a part of the good guys (the Lion guys). Later, I saw this sorcerer was with the bad guys (the Dragon guys). Then, later later, LEGO did distinction between good sorcerer and bad sorcerer. For now, I let Majisto with the good sorcerers. Dragon knights were bad guys? I never noticed. Good design for an old set. I'm a big fan of the Castle theme as a whole, but this time period is not one of my favourites. Black walls - why black walls? - and a terrible number of big ugly pieces. I'm okay with wall panels and some BURPs and LURPs, if they are accompanied by enough normal bricks and plates. Sets like this however seemed to be made almost entirely out of big parts that weren't even properly fitted with bricks to fill the gaps. And God how I hate these ugly battlements pieces - why not just build the battlements out of bricks?! This beautiful series and the (new discovery to me) Pirates theme brought me out of my Dark Ages and cemented in me a love of all things Lego that has become one of the stories of my life. Majisto in particular holds a special place as the little wizard that inspired me most. Interesting set. Got it as a kid and still have it. The box too! Do kind of like how the decorations and door cutouts on the back of box can add play potential to the set. This set was a really good deal. You got 3 minifigs, a horse and a sizable structure with rare printed pieces with dragon designs. Even today adjusted for inflation it would only cost $34, and if it were made today it would have more small detailed pieces and a better price per piece. In the the 1995 audio dramas the Dragon Knights (alongside Majisto) were actually under the command of King Lionheart of the Royal Knights who ruled the land of 'Tarenta'. They also had some never really explained rivalry with the Black Knights who were also loyal to King Lionheart. Majisto (or Cerlin, as he is called in the audio drama) has been shown as both a loyal councillor to the King and a bitter nemesis, so there might be different storylines for EU and NA, as was common back then. It was never said how the Lion Knights/Black Falcons fitted into all of this. Both Black Falcons and Black Knights were lead by a character called 'The Black Knight', so they might have been considered the same faction. Given how both Royal Knights and Lion Knights use a Lion as Crest the same could be true here. The Forestmen were considered outlaws by all other factions, although were meant to be the more 'heroic/good' guys in contrast to the Wolf People who stole just for their own good. Also according to the NA catalogue the Wolf People were former Forestmen who broke off of them. Dark Forest pretty much is the same faction as Forestmen. The Fright Knights are only ever shown to be capturing Royal Knights and Dark Forestmen so probably are at war with them, not much else is known. How the few peasants, that appeared here and there in the 80's related to the different factions is also unknown. Once the Lion Knights had been replaced by the Royal Knights as the de facto nobility, classic castle entered it's dark ages. Twenty years later, emerging from the chaos, the human factions have formed an alliance and established trading relations with Elves and Dwarfs, whilst bigger threats, including Orcs, Undead, dragons, spiders inhabit the Dark Forest and beyond.